It’s that time again where we look back on what’s happened during the previous month. 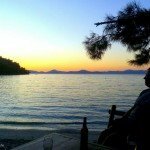 Our Fethiye news for March is packed, as usual, and, for once, it’s a tad late on purpose. A little break from the laptop over the Easter weekend – and very nice it’s been, too. It’s a bit of a cheat as I’ve still used my phone to keep all our other bits ‘n’ bobs going – Facebook, Instagram and the like – but still nice to have the ‘laptop time out.’ It’s felt like a Bank Holiday weekend! Anyway, enough of all that. All fully refreshed now so let’s get down to some goings on around the neighbourhood. Because there’s been quite a lot going on. As soon as springtime arrives, it doesn’t creep up on us. It’s a sudden burst of new energy. This has perhaps been more obvious this year with the early Easter and, therefore, a few of the season’s first holidaymakers around. If February brings the first signs of spring with its almond blossom, March treats us to a burst of colour with blossom and bloom galore. Fethiye is awash with mimosa trees, especially along the harbour, and the sunburst yellow of the March mimosa blossom has been a real treat. Duck Island has looked particularly pretty, especially on a sunny day. March is also wisteria season and numerous photos have been taken of its aromatic lilac, trailing petals. Photos galore on Instagram, including our own, and, as you’ll see below, a bit of wisteria is always much appreciated. Both mimosa and wisteria blooms are short lived but they certainly brighten up the month of March, put a smile on people’s faces and bring a flush of optimism for the season ahead. In mid March, Fethiye hosted a regional festival where food was very much the main event. Well, we were all over this. There were free samples, goods to buy and foods to sit down and eat. A stand serving foods from the Hatay region, a stall selling cheeses from the Black Sea, there was çibörek from Eskişehir, nuts and dried fruits, pişmaniye from Afyon, freshly squeezed black mulberry juice, deve sucuk (that’s ‘camel sausage’ to you and us) and then our favourite stall where we ate on a couple of occasions. Imagine our glee when two of our favourite foods were being sold together on the same stall. Happy days at the sight of a huge pile of tantuni sizzling away. And if that wasn’t enough, cağ kebab on the spit. We could hardly contain ourselves! We’re not sure why Fethiye chose to host an event like this but we would be more than happy for it to be an annual thing! The new recreation zone is really taking shape now with lots of the features now in place – including this raised circular viewing area over the sea. There’s been a bit of a ‘to do’ over the park, recently. Although each town has its own council, those towns are also under central control of a city – Fethiye’s city being Muğla. What Muğla council stands to gain from this, we’re not sure, but they decided to say Fethiye’s new recreation zone belonged to them. Fethiye mayor, Behçet Saatçi, was having none of this – the project was started before Muğla had any central control. It’s an ambitious project and the park will be the biggest in the area – and Behçet Saatçi says it belongs to Fethiye, thank you very much. Anyway, the whole thing eneded up in court and the first we knew about it was when news came out that Fethiye Belediyesi (our council) had won the case. The park is ours! 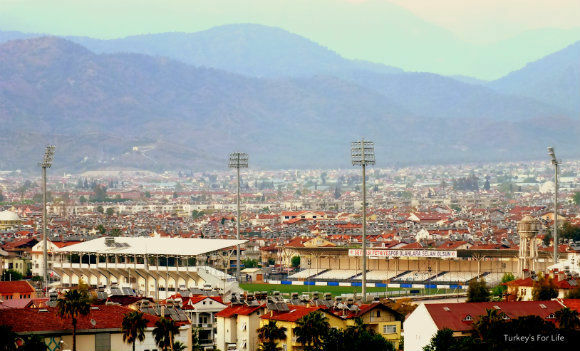 All we can say is, Fethiyespor have been playing a little bit better of late and some of the goals have been great. We were languishing in the relegation zone throughout most of March but, as you can see from the league table, we’re starting to crawl our way out of trouble. And let’s hope it stays that way and we don’t take a tumble! A few matches still to go and here are the rest of the fixtures for you. Don’t forget you can see all the match stats by clicking on the scoreline of matches played in the fixtures list. The summer season is definitely on its way and that has meant new places opening and old favourites having a revamp. Denizatı Restaurant, along the harbour, is our local and back in our January news, we told you they were closing for a while to make some changes. And make some changes, they did. It’s looking fabulous now – a whole new look. An open kitchen and bar, new loos and, as you can see, all new furniture. A local interior designer is responsible for all this and Denizatı is all shiny and updated but, most importantly, it still feels like Denizatı. There are still bits and bobs to be done, especially with the outside. Furniture is being taken away and redelivered in stages – paint jobs and new seat covers to match the look of the interior. It’s definitely a place worthy of its fantastic setting along the hrabour! Over in Çalış, Babzen Kebab opened its doors in March and we took Barry’s mum there, recently. Blog post to come about that over the next few days and we wish them a successful season! 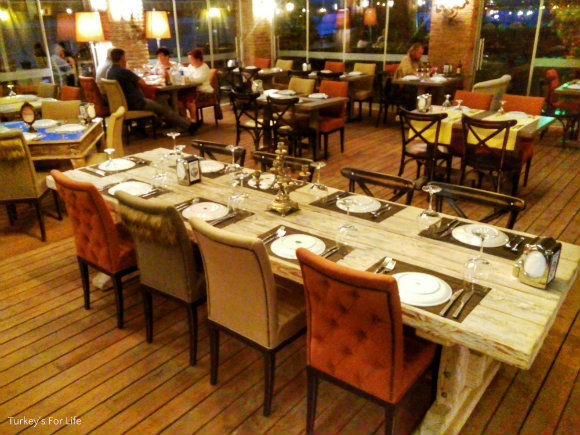 The restaurant’s owned by Salih Çetinel – he of King’s Garden fame. Staying in Çalış, the legendary Meri Bar closed its doors on 29th March after 15 years in that location. Owner, Hasan, is now getting the new Meri Bar ready for opening over the next few weeks. If this is news to you, never fear; the new place is just a couple of doors away. Bigger and looking smarter. As well as being out and about a lot to enjoy the sunny days of March, we also had lots of wet weather in the area, too. That’s meant a bit of kitchen time. Sucuklu yumurta is a great weekend brunch and, in March, we finally got around to adding this to our list of Turkish recipes. 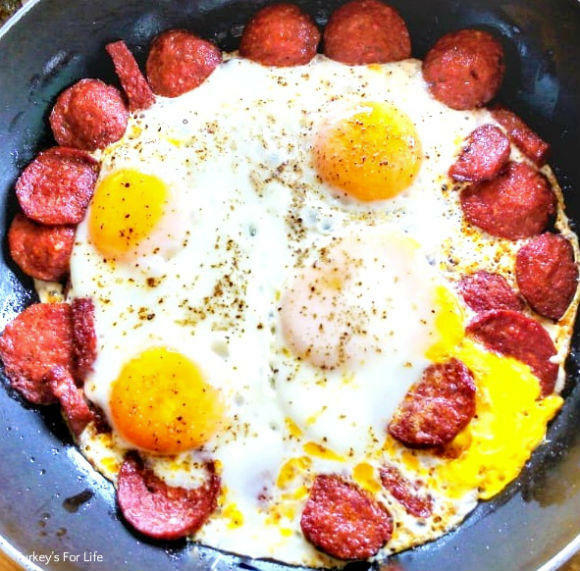 Here’s how to make sucuk and eggs. As Easter was coming up, we also shared our favourite Turkish egg recipes on social media.